Darn! 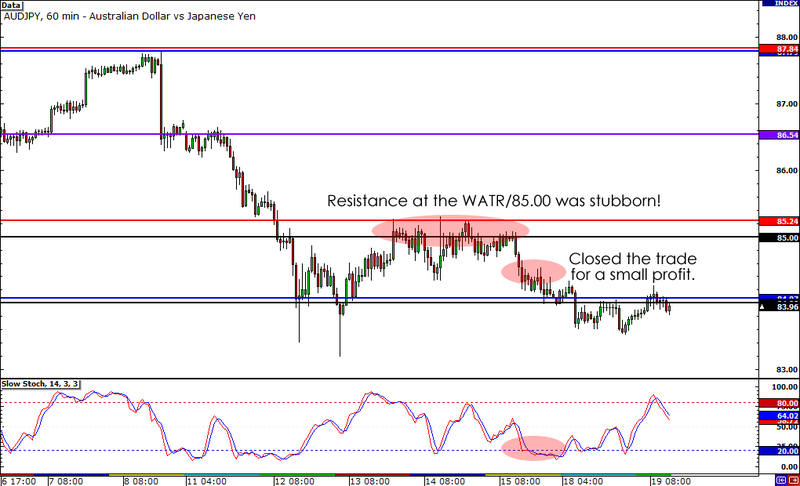 I chose a good spot to go long, but AUD/JPY just couldn’t break through resistance at WATR/85.00 major psychological handle! For a couple of days or so, the pair consolidated above my entry point (Boo yeah!) but below WATR/85.00 (Dang!). As I had expected, the Aussie remained resilient, putting up decent gains against the Greenback sometime in the middle of the week. The only problem was, the yen was strong, too! Rather than bounce off support at the 80.00 MaPs, USD/JPY kept falling, dropping all the way to 79.00 to forge a new three-month low. As such, AUD/JPY’s rally was stopped dead in its tracks, and the pair began to turn against me. Luckily, I was on my toes when this all went down. Noticing that the pair couldn’t break through the WATR/85.00 resistance, I took it as my cue to exit with a tiny profit the second Stochastic hit oversold territory. Closed trade manually: + 1 pip / +0.04%. Yup, you read that right! I was only able to bag 1 lousy pip from this trade. But small as this profit is, it’s a lot better than the loss that I would’ve sustained had I kept the trade open. Because I was alert and because I was able to recognize the signs the market dealt, I was able to walk away with a little something-something rather than a big loss. So even though I didn’t walk away with a big win, I have to say that I’m pretty glad with how this trade was managed. I worked with what was given, and took my cue from the market itself! What more can you ask for, right? Anyway, that’s all for this AUD/JPY trade, folks! This week, I’ll be looking to get back on the EUR/JPY train, so stay tuned for that! With all the craziness in Europe right now, trading euro or pound crosses might be a lil tricky. That’s why I’m gonna go with AUD/JPY this week. Fundamentally, the Aussie is a much better bet than the euro, and the only reason this pair has dropped is because the yen has been on a major rally the past few days. Now that USD/JPY is showing signs of stalling, I think yen pairs may soon push back up. Looking at the 4-hour chart, I can see that the pair has found good support at last week’s low just above the 84.00 handle. If you scroll back a couple of weeks, you can see that this was also a major support area in the past. We’ve also seen a couple of long-wicked candles, indicating that bears are having trouble pushing this pair lower. With Stochastic just crossing over out of oversold territory, I think we could see the bulls jump in now and start buying up this pair. I’ve already bought at market price (filled in at 84.39) and I’m fairly confident that this pair should keep rising. I’ve gone with a relatively tight stop, placing my stop loss at 83.50. I feel that if price we’re to dip down to this area once again, it would just mean that risk aversion is too strong and that the pair could finally break through the support level. As for my profit target, ideally, I would be aiming for the top of the range above 87.00. However, in this environment, I think it might be a little too ambitious, which is why I’m going to be watching this trade carefully and will be taking profit depending on what’s happening in the market. 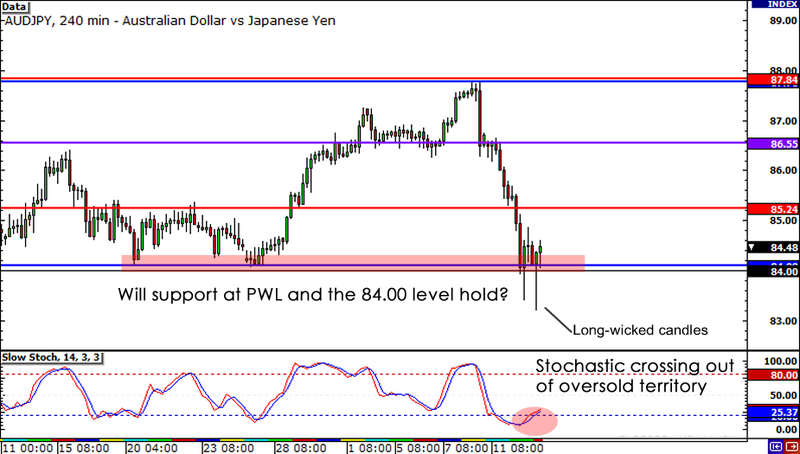 Buy AUD/JPY at 84.39, stop loss at 83.50, profit target to be determined. It’s the middle of the week, so we could see a midweek reversal take place. For those of you who are joining me on this trade, good luck! If you have any questions or suggestions, feel free to comment below! You can also hit me up on Twitter and Facebook! Peace out, homies! Where will AUD/JPY close by the end of this week?